I'm giving myself a big pat on the back for getting so much accomplished in January. Yesterday I pulled out a little hand stitched piece I learned to make from my dear friend, Cecile, while I was living in Paris. It is a Boutis piece. 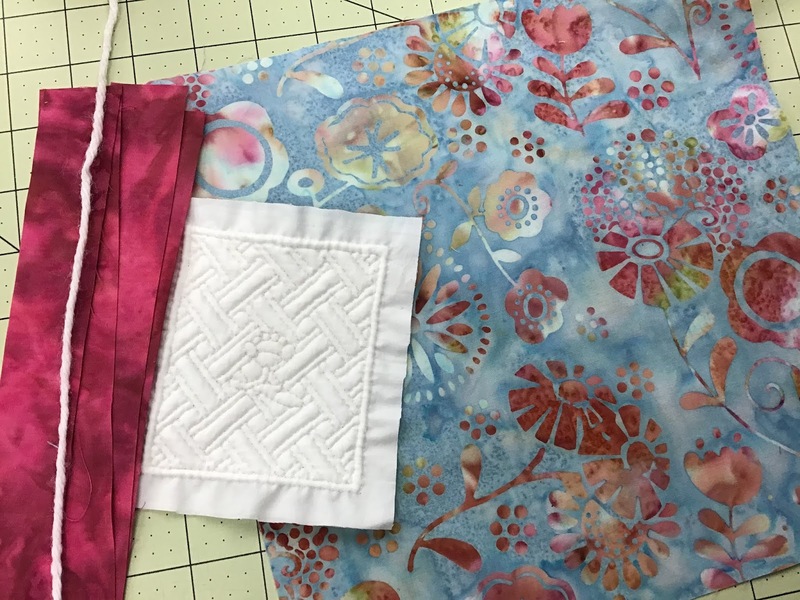 Two layers of fabric are stitched together with tiny stitches to create a design and you use a long needle to pull yarn through the channels you've created. I planned to turn it into a pincushion as soon as I finished it but...four years later it has finally happened. I found a batik 10-inch square with the perfect colors and a few dark pink scraps. Just made it up as I went. I also had a huge bag of crushed walnut shells in my studio for four year that were opened yesterday. Such great memories in this sweet Boutis project. Thursday was Breakfast Club but instead of working on the official project for January, I brought in a set of UFO blocks to finish. 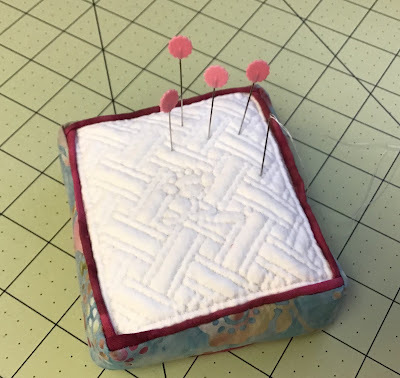 I reached my goal of making 30 blocks which gave me a total of 160 so I can now make two twin quilts for my guest bedroom bunk beds. I spent another half day at home laying out the blocks on my design wall and now have them all packed up for the February retreat. 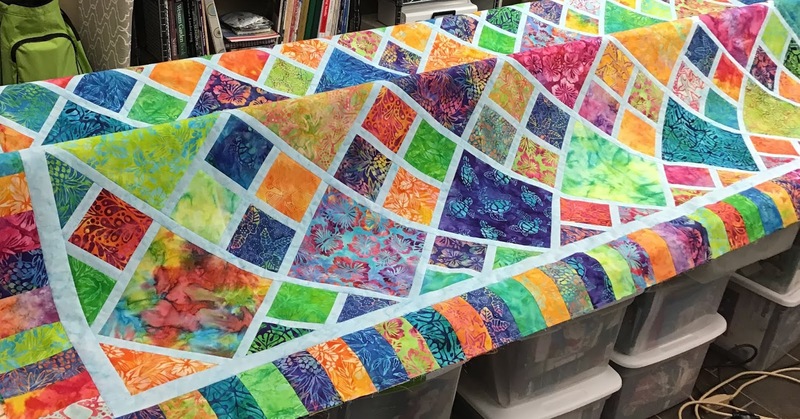 I started this bright tropical quilt at last year's February quilt retreat. 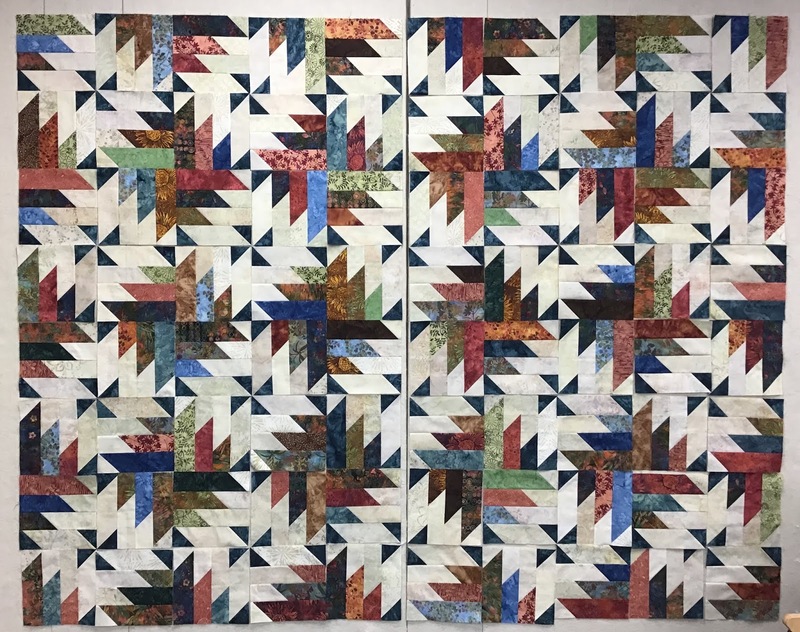 It is 110 x 110-inches so I was struggling with the long rows in the crowded retreat space. And then when I got home to my huge studio...all the parts sat in a box for months. 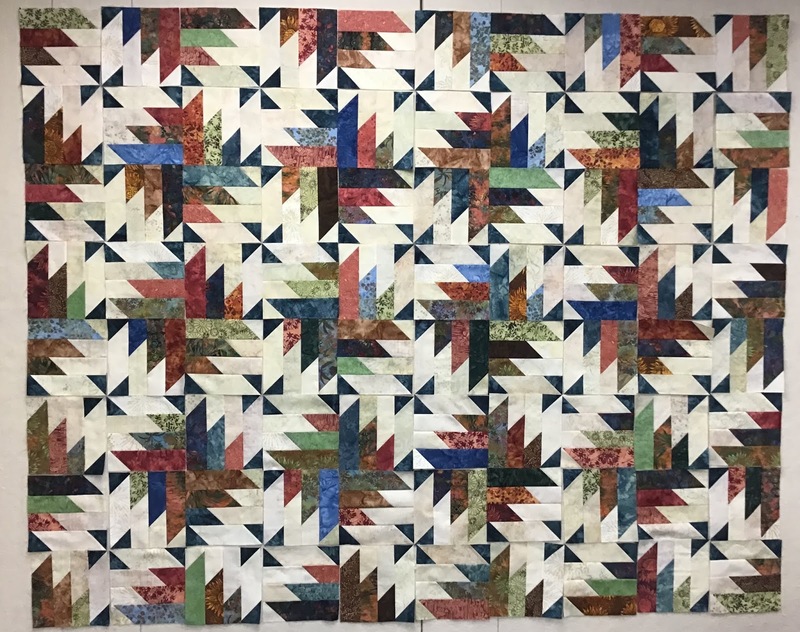 I'm so glad I got it done in time to share my finish a year later. It would be really nice if it was quilted too! 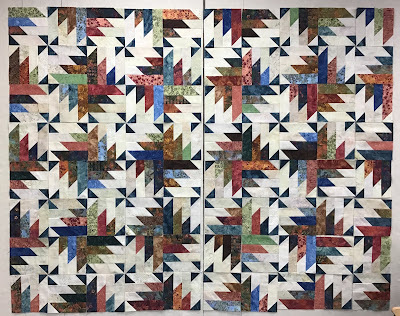 Maybe by February 2020 quilt retreat! 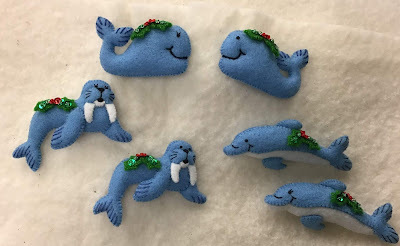 A few more critter ornaments got finished last week. Blue critters that live in water. I still have a couple of Christmas trees up in my house. I think I will leave one of them up until I finish all the ornaments in this Noah's Ark kit and get a photo with them on the tree. I love that idea! love that tropical quilt - what great color!! 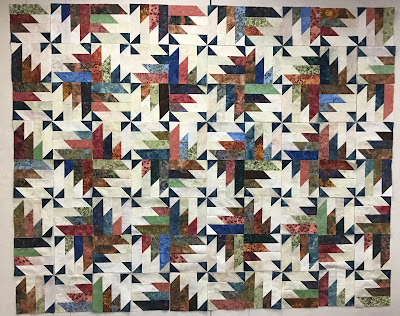 The tropical quilt is stunning. I brought back some batik from Hawaii and this could be the ticket. Question on another note: What is the pattern for the Christmas Moose? Ohhh sweet memories..... Your boutis is beautiful Debbie !! Congratulations ! I love your project for January !! And the blue fishes are soooo fun !! I'm loving the felt ornaments...and of course, your use of batik fabrics makes my little ol' heart happy! Those are all wonderful projects, great job!